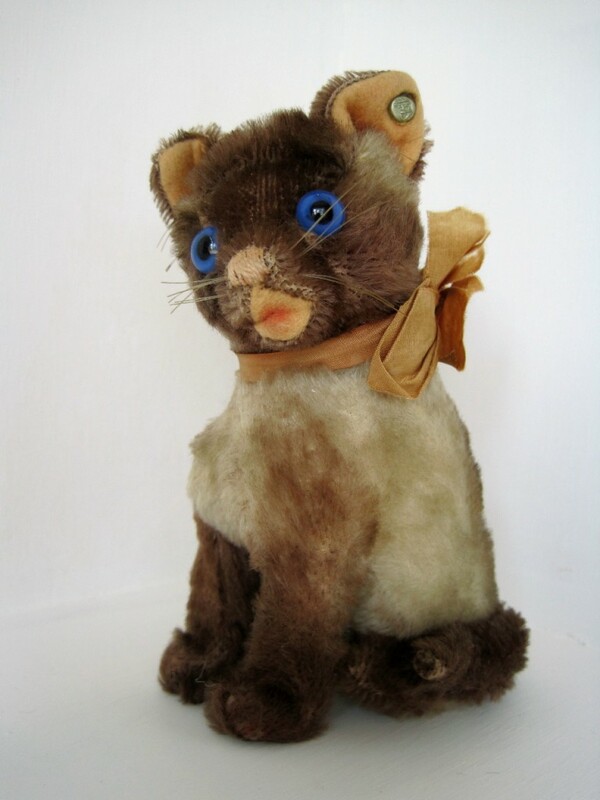 Here’s the “cat’s meow” of Rebekah’s Steiff cat collection, a 15 cm Siamy from 1953-1954. Cats are truly a legacy species for the Steiff Company. Felines of practically every breed, shape, and size have been featured at one time or another in the Steiff menagerie. As a matter of fact, cats have been in the catalog since it was first published in 1892; at least six cat designs were featured in the charter edition alone! One of the most beloved Steiff cats of all time is an absolutely charming model called Siamy, the Siamese cat. Steiff enthusiasts would say this Steiff rarity is truly in a “cat”-a-gory all of her own. She was produced for just a handful of years in the 1930s and again in the 1950s; both pre- and post-war models are extremely sought after by collectors. Siamy made her debut in 1930 and was produced in 14-, 17-, 22-, 25-, and 30-centimeter sizes. The next year, this identical pattern was produced with a tail-turns-head mechanism. This early Siamy was made in tan mohair or wool plush. Her ears, tail and front paws were brown; her face was detailed with carefully applied airbrushing to give her a realistic “Siamese Cat” appearance. She had a small, vertically hand-stitched, heart-shaped pink nose and a simple pink closed mouth. All early Siamy cats featured the “trailing F” style Steiff button, indicating their period of manufacture in the 1930s. Perhaps Siamy’s most well-known, outstanding feature was her incredibly intense, cobalt blue glass pupil eyes—making her quite “a looker!” However, despite her popularity and striking good looks, the early sitting version was last noted in the catalog in 1933. As natural product line extensions, Steiff produced a 17-cm glove puppet called a Kasperl-Siamy or Punch Siamy, based on the basic Siamy head design, from 1930 though 1934. Steiff also made a 30-by-30-cm Siamy Nachthemdentasche or Siamy pajama bag from 1930 through 1937; both of these items are exceptionally rare. Siamy made another brief appearance in the Steiff line from 1953 through 1954. She was produced in 11-, 15-, and 23-cm sized only. All post-war Siamy cats left the factory in Giengen, Germany with a raised script button (or RSB), indicating their period of manufacture in the 1950s. The post-war pattern did have a few updates over the pre-war version. First, the ears: In the newer versions, the 11-cm version had tiny pink felt ears, while the 15- and 23-cm sized ones had pink felt lined ears backed by brown mohair. Pre-war, all Siamy cats had solid brown mohair ears. Second, the mouths: In the newer versions, the two larger Siamys had open, felt lined mouths; the very inside of each open mouth was detailed with the smallest touch of pink airbrushing, to simulate her tongue. All prewar Siamy cats had closed mouths. But one thing about her pattern didn’t change one bit over time—she retained her famous trademark blue eyes. From her introduction, Siamy has always been an absolute crowd favorite. Her distinctive coloration, usual eye color and adorable presentation have maintained their appeal—and value—with feline fanciers for 80 years. A 1930s Siamy cat in good condition with ID could easily be valued in north of $1,000. The 1950s versions in good condition with ID usually value in the range of $200-500, depending on size. Rebekah Kaufman is a Worthologist who specializes in vintage Steiff and other European plush collectibles.